Replies: 62 (Who? ), Viewed: 60101 times. #26 25th Jul 2006 at 1:35 PM Last edited by IgnorantBliss : 25th Jul 2006 at 1:47 PM. MizzesSimmer, the GUIDs were incorrectly linked. Check them to see what I did to see how they are supposed to be. Make sure to double-check the GUID linking part of the article . The diagonal version works now, just the wallmask needs fixing . Pistachio, I'm sorry it's taken so long to reply, I somehow forgot about this post. I fixed the GUID linking, but you will still need to rotate the diagonal mesh in your mesh editor. With curtains, the diagonal is rotated 45 degress, while with windows and doors the diagonal mesh is imported in the same angle as the straight one. For whatever reason. #28 25th Jul 2006 at 5:00 PM Last edited by MizzesSimmer : 25th Jul 2006 at 6:04 PM. ***So I checked it out and now I just feel dumb lol. I knew it, i choose the wrong guid as the master in the diagonal version. I wasn't thinking when I looked them over. Ty again! I did notice something though, the diagonal version was still grabbing the origional windows mesh along with my new mesh, which made for one funky looking window. So, i scrapped both the packages and started over, because I wasnt sure where to look to fix that and I need the practice anyways. Hmm, I'm using SimPE 0.58.29278. 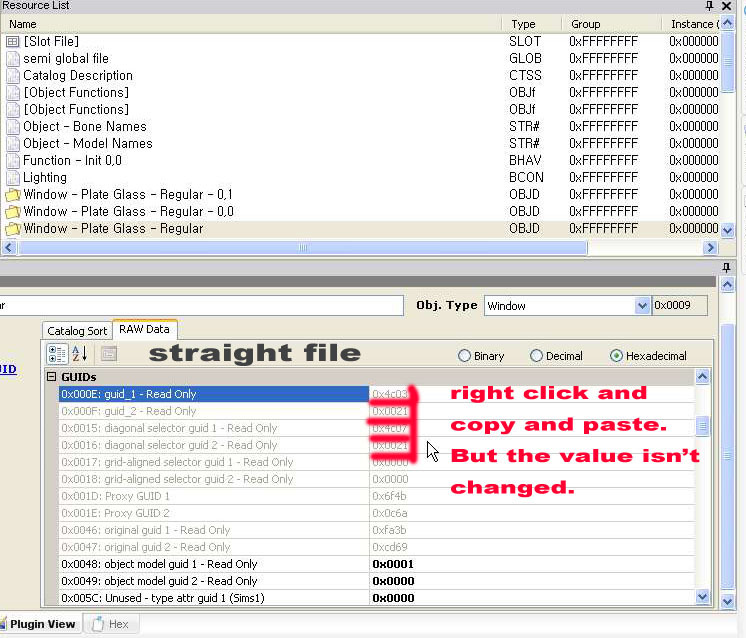 The Object workshop, under Decorative>Crutains is only showing me straight versions with thumbnails, nothing with x's. Under mirrors they are all x's...??? The diagonal curtains are listed under Unknown in Object Workshop . pulling out my hair!! ahh! help please!! alright i have been trying this over and over and over for a while now and it's just making me pull my hair out! i need outside help! so, here's the files, if anyone can find anything wrong with them pleaes let me know and i will try and fix it! thank you!! #32 9th Aug 2006 at 11:31 AM Last edited by Numenor : 9th Aug 2006 at 11:52 AM. 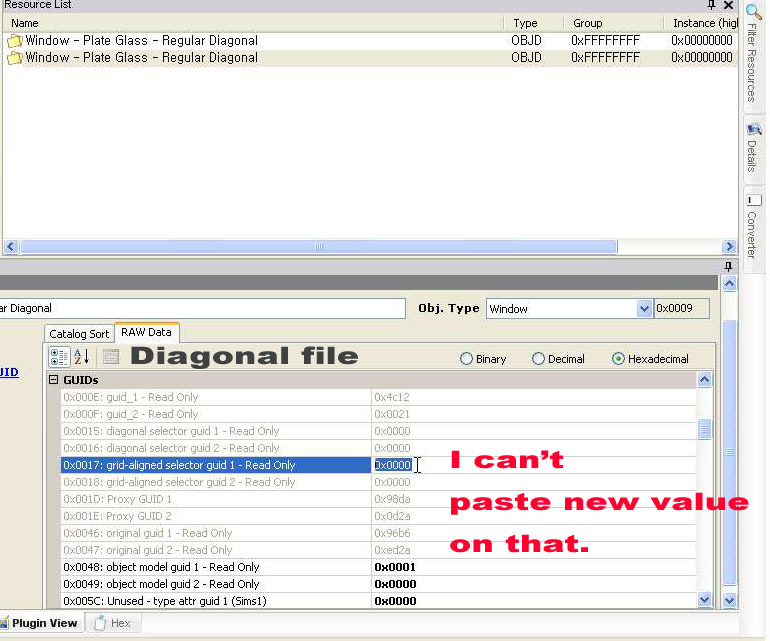 Obie505 - In the diagonal package, the two values "Grid-aligned GUID" must contain the GUID of the straight package; but I've found "0x0000" in both of them. In the straight package, the two fields "Diagonal selector GUID" must contain the diagonal GUID: the first one contained the value "0xedbc" (that is the last part of the original Maxis GUID), while it should contain the value "0x993C". Here is the fixed package. #33 10th Aug 2006 at 6:51 PM Last edited by Obie505 : 10th Aug 2006 at 7:21 PM. My apologies! I thought I posted something on the other thread and then I went there to check it and saw that I didn't so I thought it was just a little technical difficulty however, it was just me! So, I"m not really sure what you're talking about when you talk about those GUIDs because I don't see those in my package at all. So....I don't know? Ha. I'm just wondering because I do have other windows and doors that I need to get the diagonal for so if you could let me know, it would be greatly appreciated! Thanks! This is so embarrassing. It says that right in the instructions and although I didn't notice that before I did look for the diagonal curtains in "unknown". Now I can't imagine why I couldn't see them. Thanks. You are all so nice. I really enjoy making Sims 2 stuff and I'd never have gotten anywhere without all your help. bibidoublezero, what happens if you change the view in Raw Data tab to decimal instead of hexadecimal, does it work then? Other people have been reporting this same problem, and I have no idea what's causing it. It only seems to be happening to some, not others. Try uploading the packages here and I'll take a look, if I manage to change them . This message has been deleted by bibidoublezero. I have install an older version of SimPE (the 0.44c) in my other computer and i can see now in the Rawdata table the guid in the hexadecimal mode, there is not the "0xffff" value ... Oufff And miracle, the diagonal window is visible in my game, but with error. I can see that i made a invert error with the north and south .obj files, and the wallmask file is too big and i don't know why... I try to modify for that my creations are better and without error. 7th Oct 2006 at 10:16 PM Last edited by momma"b" : 14th Oct 2006 at 1:08 AM. This message has been deleted by momma"b". I don't know if anyone still checks this or not. I'm having another problem with some windows I am working on. When I go to link them, I cannot edit the read-only blocks. I'm sure I'm missing something obvious again, but what am I doing wrong? #43 1st Dec 2006 at 1:11 AM Last edited by stonetower : 1st Dec 2006 at 1:21 AM. I have the same problem with Reyn about editing RAW Data. It means that I can't copy and paste the read-only blocks in the RAW Data. But It was possible to do in the SimPE Ver. 0.58. I always appreciate items and tutorials of simPE-creators. Linking straight and diagonal objects has changed with the latest SimPE, and you now do it on the main tab of ObjectData, you don't need to go into Raw Data anymore. You will see spots to fill in the grid-aligned and diagonal GUIDs on the left of the main ObjectData tab. Thank you for your help, indeed. I had to know what has changed with the latest SimPE. This was not problem but my ignorance. Oh, okay - thanks again! I'm making a glass block window and I cloned the 'Arch of Antiquity' to do this. But in-game, the window states 'cannot be placed on a diagonal wall'. All I can think of is that I changed the subset names in the straight version, and tried to replicate this in the diagonal. Is there anything horribly obvious I've missed? Thank you for any help you can give! I've noticed something odd, though. Usually, the windows can be placed on a wall (straight or diagonal) ona any of the two wall faces; but your straight window can be placed in one direction only (I mean, with the arrow in the green tile-marks facing always the same direction); if I try to put them on the wall turned by 180°, I get an error message saying "must be placed on a wall. My only suggestion is to try to clone a different window. Infact, the moroccan window has been updated by one of the EPs, because of its (malfunctioning?) diagonal. Thanks, Numenor, for looking at the stupid thing. I noticed that I couldn't turn the straight window round but I thought it was my lot was just being silly. Still, I'm sure I'll smile all the way through doing it all over again!!! Thanks once again for looking at it. It WOULD misbehave! This is a set I wanted to upload here at MTS2 first!